Chickens are not particularly picky when it comes to nesting areas -- they will nest quite as happily under a brush pile as in fancy commercial nesting boxes. In fact, nesting boxes are primarily designed for the convenience of humans, not chickens. As long as they have a bit of privacy, feel relatively safe from disturbance by predators, people or other hens, your chickens will nest almost anywhere they can fit. Your job is to make them like nesting where you can still find their eggs. Though most old-timers will tell you a nest box around 12-by-12-by-15 inches deep is a good standard for most breeds, one enterprising couple's experiment in resizing nest boxes demonstrated that their chickens liked a rather snugger nesting environment. Mel and Patrick of ByExample.com found that too much room made their hens competitive and lowered egg production, so experiment with varied-sized cardboard boxes to find one that suits the size and psychology of your particular breed of hens before investing in a lot of expensive building materials or commercial boxes you may regret. 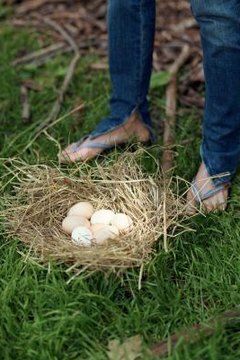 After you find the ideal-sized cardboard box for your hens, use those measurements to search out more permanent nesting box possibilities, keeping these other things in mind. Plan to raise the nesting boxes off the floor to discourage predators and make egg gathering easier, and include a perch or ramp so your hens can reach the higher nests and get back down safely. Install the nesting boxes in a quiet area of the hen house, away from the everyday activity of your family and the rest of their flock. The ideal area for most hens will be relatively dark, but well-ventilated in summer and warm in winter. Hens suffering from temperature extremes or other stress may abandon nesting boxes for quieter, more comfortable locations. For serious recyclers and the frugal-minded, there are many alternatives to the wooden rectangle. Milk crates, enclosed cat litter boxes, lidded plastic storage containers and old dresser drawers make excellent rectangular substitutes. If shape doesn't concern you, let your imagination soar. Turn 5-gallon buckets or large plant pots on their sides and screw them to the walls or set them within a simple frame to prevent rolling. Employ a row of large mailboxes on a wide shelf, or set old tires on a raised platform on the floor and fill them with straw for instant nesting “boxes.” Empty wine crates and bushel baskets work too.